UPDATED: Fri., Dec. 29, 2017, 12:16 p.m.
By mail: Checks may be mailed to The Spokesman-Review Christmas Fund, P.O. Box 516, Spokane, WA 99210. In person: Bring your donation to the lobby of The Spokesman-Review at 999 W. Riverside Ave. Please mark prominently, CHRISTMAS FUND. Online: Visit www.spokesman.com/sections/christmas-fund and click the PayPal button. If you’d like us to send you a receipt for your donation, make sure to include your mailing address in PayPal’s comment box. If you’d like a receipt via email, just include a valid email address. In either case, we won’t share your information with anyone or use it for any other reason. And feel free to use the comment box to tell us anything you’d like. Email The Spokesman-Review at christmasfund@spokesman.com. Sometimes it is the simple toys that are the best. 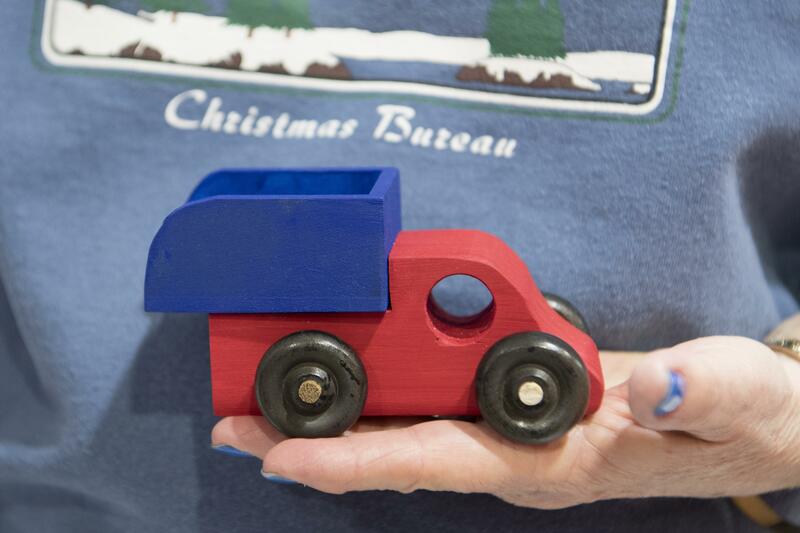 Christmas Bureau volunteer Janet “Pinki” Culbertson recruited the Vets Garage to make simple wooden trucks for the Bureau this year. They were able to make 100 before the doors opened on Dec. 8. “They gave them away the first day,” Culbertson said. The garage doesn’t have anything to do with cars, except wooden ones. It’s a woodworker’s dream created to assist veterans. It occupies a small building at 1102 W. College Ave. just across from the Spokane Regional Health District. The veterans were able to make an additional 25 cars in time for the last two days of the Bureau. But they have no plans to stop, said office manager Pamela Johnson. It’s a good thing more people are interested, because Johnson has big plans for the 2018 Christmas Bureau. She wants to make enough trucks that there will be 100 to 200 to hand out each of the 10 days the Bureau is open. This year the group had only three months’ notice. But even though there’s plenty of time to make the trucks for next year, there are still some bumps in the road. The veterans will need plenty of two-by-six pieces of wood to be crafted into trucks. They also have to pay $1.75 for each set of wheels as well as buy dowels to act as axles. Anyone interested in donating wood or money toward the truck-making effort is asked to stop by the garage. New donations of $20,011 for the Christmas Bureau have brought the year-to-date total to $465,682.84. There are only a few days left to make the goal of $525,000 to pay for the food vouchers, toys and books handed out to those in need. PayPal donations must be made by Tuesday to allow time for processing, and donations by check must arrive by Wednesday. Any donations received after that will be credited toward the 2018 Christmas Bureau. Avista Utilities donated $5,000. “Each year during the holidays, we come together as a community to make sure that families can celebrate with the warmth and joy of food and gifts,” wrote CEO Scott Morris. “The Fund brings together a wonderful partnership of community resources and volunteers that truly exemplifies the spirit of the season. Ted Olson and Stacy and Tom Brunke sent $1,000. “Hope this helps in your most important goal to help others,” they wrote. Michael and Linda Jensen, of Spokane, donated $1,000. John and Lori Moloney, of Spokane, gave $1,000. “Thanks to Catholic Charities and The Spokesman-Review for helping so many families for so many years,” they wrote. Jim and Salli Sledge donated $500. An anonymous Spokane donor gave $500 in memory of Dr. Leroy Byrd, his parents Herman and Bernida Byrd and his in-laws, Agnes and O’Neil Jones. “Dr. Byrd volunteered several years and donated time and effort for the Bureau,” the donor wrote. An anonymous Spokane donor gave $400 in honor of the firefighters in California. “My blessings have been abundant again this year and I wanted to acknowledge that with this donation,” the donor wrote. Jerry and Paulette Firor, of Spokane, gave $351. Patricia Selden, of Spokane, sent $300 from her grandchildren, Jake, Max and Lila Selden. “Thank you for the great job you do,” she wrote. An anonymous Spokane donor gave $300. “Thanks for your many years and efforts in providing this great service to our community and providing an opportunity for so many to help in small ways,” the donor wrote. Daniel Lennon, of Spokane, donated $250. An anonymous Colbert family donated $250 in honor of their parents. John and Sherry Gaiser, of Spokane, sent $210. Susan Hoover gave $200 via PayPal. Sandra Fiksdal, of Spokane, donated $200, as did Hope and Gary Roszell, of Spokane. Mike and Rita Gibson, of Spokane, gave $200. “Best wishes for a successful collection!” they wrote. Brant and Naomi Hall, of Spokane, sent $200. An anonymous Spokane donor gave $200. “Thank you so much for all the work of the volunteers,” the donor wrote. Jeff and Becky Olson, of Spokane, contributed $200, as did Larry and Tudy Hatch, of Spokane. Joe and Carolyn Schauble, of Spokane, donated $200 in memory of their parents, Robert and Mary Schauble and Carl and Edna Magee. Robert and Marge Folsom gave $200 in memory of their grandson, Randy Folsom, who died this year. The Vinje sisters, formerly of Spokane, donated $185. The sisters are Prasti Vinje Purdum and Astrid Vinje (Bush), both of Seattle, and Michelle Vinje (Petty), of Edmonds, Washington. Brian and Murlaine Steckler, of Spokane, gave $150, as did Jon and Arlene Gordon, of Lacrosse, Washington. An anonymous Colbert donor sent $150. Robert and Susan Anselmo, of Spokane, donated $150 in memory of Carol Speltz. William and Eileen Dittman, of Spokane, gave $150. Anne Katsaris donated $100 via PayPal, as did Diane Ketcham, of Spokane, and Alicia Sullivan. Gratia Hasness, of Spokane, donated $100 in honor of Terry and Paul Giordanella, “who care so much for others.” Jerry and Dorie Berger, of Spokane, gave $100 in memory of longtime Christmas Bureau volunteer Don Kelly. An anonymous Spokane donor gave $100. Judy and Bill Camden, of Spokane, sent $100. “Blessings to the wonderful volunteers for the work they do to help those who are struggling during this holiday season,” they wrote. Minnie Samek, of Spokane, donated $100 in memory of her husband and son and in honor of the family and friends helping her. “I couldn’t do it without them,” she wrote. The following people donated $100: Donald and Janelle Higgins; Kay Nielson, Joyce Sylvester, Myrna Shockley, David and JoAnn Schwartz, James Bankston, Gale and Dianna Morasch, Don and Anna Foss, Ronald and Linda Schultz, and Barbara Traynor, all of Spokane; Dean and Elizabeth Grafos, of Spokane Valley; Norma Echelbarger, of Spokane Valley; and Patricia and Michael Hostetter, of Nine Mile Falls. Joe and Charri Doeleman, of Spokane, contributed $100. “Charri and I are very happy to be able to give to this fund again this year,” he wrote. “We hope all will have a very Merry Christmas and happy new year.” Tom and Mitch Solberg donated $100 in memory of their parents, Bill and Kate Solberg and George and Norma McNally. The Fulgaro family of Spokane donated $90. Beryle and Paul Thomas, of Spokane, contributed $75. Nancy Mackerrow and John Stephens, of Spokane, gave $75, as did Jeff and Christine Stevens, of Spokane. Ralph Walter gave $50 via PayPal in memory of Carol Walter. An anonymous donor gave $50 in memory of Judy Woolen. The Wednesday Afternoon Knit Group sent $50 via PayPal. Kris Spelman, of Spokane, donated $50 in memory of her grandmother, Violet Burgunder, and great-aunt, Elsie Altin. Two anonymous Spokane donors each contributed $50. Glen and Kim Taylor gave $50. “Thank you for all your good work,” they wrote. Two anonymous donors each sent $50. Fred and Kris Jessett, of Spokane, contributed $50. Mark Johnson, of Nine Mile Falls, gave $50. Matt and Barb DePauli, of Spokane, contributed $30. “Thank you SR for handling this fine program,” they wrote. An anonymous Spokane donor gave $25, as did an anonymous Veradale donor. An anonymous Spokane donor contributed $20, as did Martha and Lowell Lehman, of Spokane. Another anonymous donor gave $20. An anonymous donor gave $10 via PayPal. For donations made through PayPal, The Spokesman-Review contributed the processing fee. Editor’s note: This story was changed after publication to remove incorrect information about the creation of the Vet’s Garage. Published: Dec. 24, 2017, 6 a.m. Updated: Dec. 29, 2017, 12:16 p.m.